Understanding knee anatomy, and the structures that make up the knee can help with injury prevention, as well as your injury treatment. The knee is a commonly injured joint during sports activities. From ACL tears, to meniscus tears, knee injuries can often effect your ability to participate in sports. Not only does anatomy knowledge help you determine what kind of injury you may have, it also helps to understand how all of the different parts of the knee work together in normal function. Visit our main anatomy page for a refresher on anatomy concepts and different types of tissues. 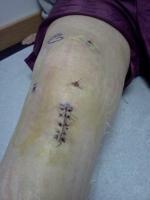 Below you will find detailed information about the knee. And don't forget to take the knee anatomy tour. I explain all of the important structures of the knee, and how they can be injured. Knee anatomy starts with the bones making up your knee joint. Your knee is a hinge type joint that allows for the movements of flexion (bending) and extension (straightening) of the leg. The knee joint is made up of two bones, the femur (thigh bone) and the tibia (shin bone). These two bones touch each other and make up the tibio-femoral joint. Injury to either of these bones usually involves a fracture. While not common, such injuries often require surgical intervention. The tibio-femoral joint is considered a weight bearing joint. Another important joint in your knee is the patello-femoral joint. 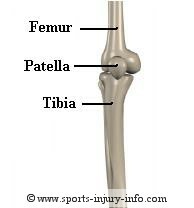 This is the articulation between the patella (knee-cap) and the femur. The patella is a small bone that is actually enclosed inside the quadriceps tendon (a sesamoid bone), and helps provide extra leverage for the quadriceps muscles when straightening the knee. Problems at the patello-femoral joint include patella femoral syndrome, patella chondromalacia, and patellar dislocations. Ligaments are connective tissue that connects bones to other bones, and are an important part of knee anatomy. There are four major ligaments in the knee. The medial collateral ligament (MCL), the lateral collateral ligament (LCL), the anterior cruciate ligament (ACL), and the posterior cruciate ligament (PCL). 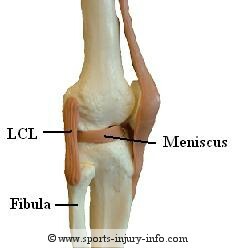 The MCL and LCL are on the inside and outside of your knee, and help to keep your knee from moving from side to side. The ACL and PCL are inside of your knee joint, running between the femur and the tibia. They help to keep your tibia from moving out from under your femur. 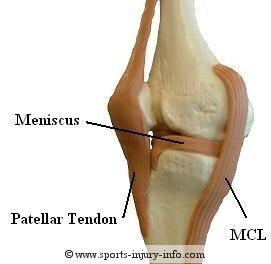 The ACL and PCL cross over each other inside the joint, which is how they get there names. (cruciate = to cross). The joint capsule is another connective tissue structure that surrounds your knee joint. Out of the major ligaments, the ACL and MCL are the most commonly injured with sports activities. Within the knee joint there are two different types of cartilage: fibrocartilage and articular cartilage. Both serve different functions, and can be injured during sports activities. The meniscus is a thick, dense connective tissue that sits between your tibia and femur. It helps to provide shock absorption and cushion for your tibia and femur, as well as making your knee joint more congruent. 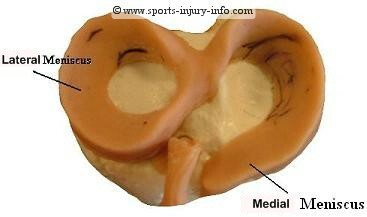 The meniscus is made up of both a medial and lateral part. As you can see in the picture below, they form a circular shape around the top of the tibia, and help to cushion the femur. They also serve as a sort of "chock block" to keep the knee stable. Meniscus tears are common sports injuries, and are often caused by twisting your knee. Articular cartilage is a hard and very slick surface that lines the ends of the bones where they articulate, or touch each other. This helps to reduce friction between your bones during movement. Articular cartilage relies on the synovial fluid within the knee joint to get its nutrients. With abnormal pressures, parts of the cartilage may begin to deteriorate. This is common on the femoral condyles, and on the under surface of the patella. The last major area of knee anatomy include the muscles and tendons. There are many muscles that surround your knee joint. The thigh muscles, or quadriceps, are a group of four muscles that start at your hip, and extend down the front of your upper leg, inserting into the patellar tendon on the tibia, just below your kneecap. The quads straighten your knee out when you contract them. The hamstrings are the muscles on the back of your thigh. They are a group of three muscles that start at your hip and extend down the back of your upper leg. They insert on both the medial and lateral sides of your leg, just below the knee joint. The hamstrings bend your knee when you contract them. Other important knee anatomy considerations are the muscles along the inside and outside of your upper leg. These include: tensor fascia lattae, gracilis, sartorius, and the adductor group. The knee muscles function to control the movement of the knee joint and to maintain stability in the sagittal plane. Co-contraction of the quadriceps and hamstrings helps to stabilize the knee joint. These muscles are important with any type of sports activity. Each of the muscles attach through a tendon. Several tendons are of importance to sports injury anatomy because they are often injured or inflammed with activity. 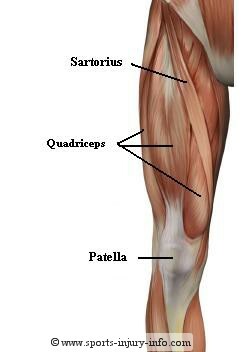 The quadriceps tendon attaches the four quadriceps muscles to the patella just above the knee. The quadriceps tendon is one of several tendons that can be susceptible to tendonitis. The patellar tendon attaches the patella to the tibia via the tibial tubercle. Because it runs between two bones, it is sometimes referred to as the patellar ligament. It effectively completes the attachment of the quadriceps to the lower leg. 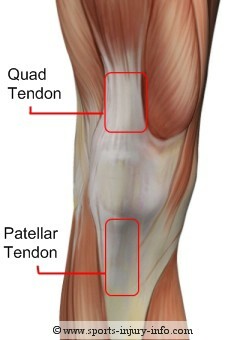 The patellar tendon is much thinner than the quadriceps tendon, averaging about 30mm wide. Patellar tendonitis is a common injury to this structure. The illiotibial band is a very long tendon, attaching the tensor faciia latte muscle to the knee. The TFL is a hip abductior, and helps to provide some medial rotation of the tibia. The IT band attaches on both the fibula and the tibia on the lateral side of the knee. As the knee flexes and extends, the illiotibial band moves over the head of the fibula. If this knee tendon is tight, it can cause irritation and inflammation at its insertion. This knee injury is known as IT band friction syndrome. The hamstrings are the primary knee flexors, and they run along the posterior side of the thigh. These knee tendons attach to the tibia and the fibula along the medial and lateral sides of the knee. Hamstring tendonitis is a common knee injury with sports. All of the muscles, tendons, bones, ligaments, and cartilage work together to keep your knee functioning correctly. Understanding knee anatomy is the best start for preventing and treating knee injuries.